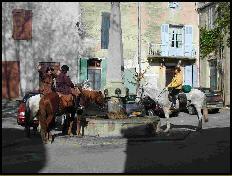 Cucuron is a small unspoilt village situated at the foot of the southern slopes of the Luberon range of hills. It was more important in the 16th century (many houses remain from this period) and, although it was not involved in the Vaudois heresy, it suffered a gradual decline in the religious wars and only recently regained its former population (currently about 1800 people). It is still almost entirely agricultural, and is surrounded by some fields of olive and fruit trees, and with the advent of the appellation for Côtes du Luberon, by vineyards. There is a good local museum which is worth a visit on the way up to the church (unexpected rare fresco of Roman ship, intriguing old photos of village life). The view from the top of the hill near Le Point is fine, and well seen (briefly!) in the film Horseman on the roof. 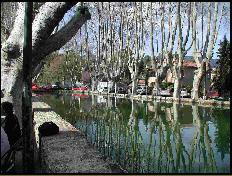 A special feature of the village is the old carp pond surrounded by plane trees where the weekly market is held on Tuesdays. 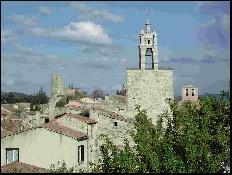 It was featured in the 2005 film 'A Good Year in Provence'. This video clip gives you a good taste for the village, filmed on the day of the festival of Arbre de Mai - the first Saturday after 21st May. This clip takes you for a walk around the Tuesday market in Cucuron. There is a small tourist office in Cucuron, two minutes walk from Le Point, which may be contacted by Email telephone: 04 90 77 28 37 or fax: 04 90 77 17 00. 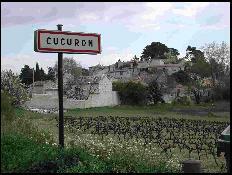 It has a website at: www.cucuron-luberon.com with current information about village activities, restaurants, local places to visit etc. There is a section in English but it has less information than the French version (which has, for example, some downloadable leaflets). The sites www.theluberon.com/places/cucuron.htm & www.beyond.fr/villages/cucuron.html provide further information about the village.